ShowingTime provides agents and listing contacts multiple methods of notification when they have received a message, making sure you are always in the loop and never miss that vital message. You can track these messages in your message center on the desktop or the mobile app. 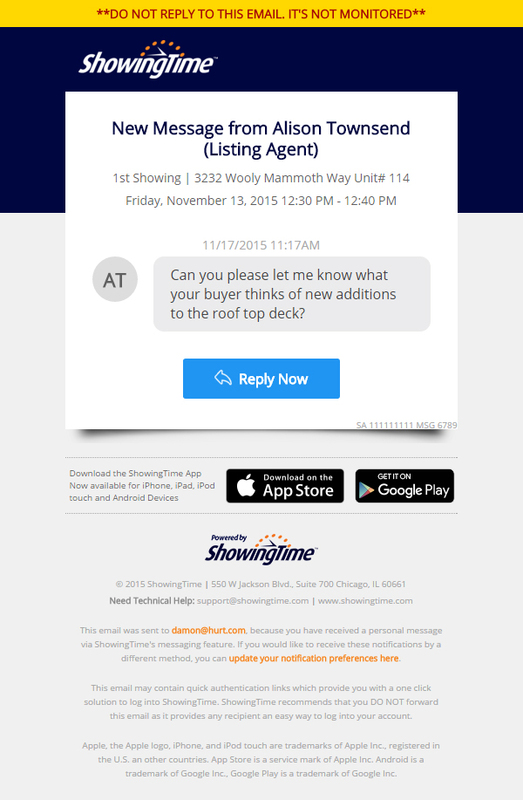 ShowingTime recommends that all agents and their listing contacts use the ShowingTime App for quicker communication via push notification. To learn more about the benefits of the ShowingTime App, follow the link below. The name of the agent or listing contact that sent you the message. Basic Appointment or Viewed Instructions Details. The date and time it was sent. Easy access to reply to the message. Easy access to your profile settings. Easy access to reply to the message via the ShowingTime App. Notifications can be configured from your desktop profile or the ShowingTime App. For more information on how to configure notifications via your profile, follow the link below.